The BFM and family came across this pizza recipe from a chap who was demonstrating good healthy food and selling very pricey pans!!!! The gent brought all his wares and began by chopping up some onion, mushrooms, peppers and tomatoes. He then grated some cheddar. Meanwhile he heated a frying pan to medium heat and placed a tortilla in it and warmed it up. He spread some tomato purée and added the pizza toppings. Let it cook for a couple of minutes and finished it under the grill for few mins. It was tasty,not a lot of base,the base was crispy and it was so easy to make.So that’s what our dinner was. 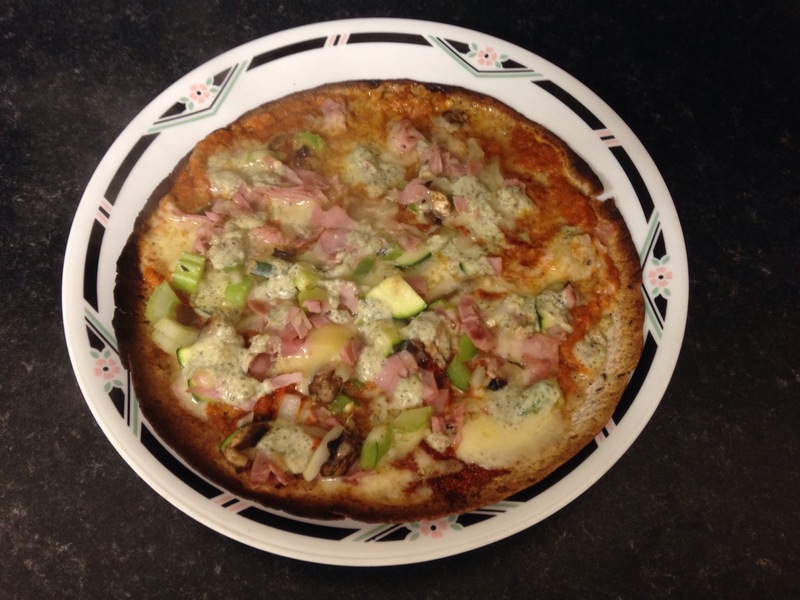 I added ham and courgettes.